Surrounded by orchards, restored farmhouse. Beautiful view. Calm. Swimming Pool. to search at the bottom of the heading "EQUIPMENTS"
In full nature, Sibadal completely restored with taste in 2004 offers vast open spaces on the countryside. The house is open on the nature and the large garden. The fenced swimming pool (salt water without chlorine) is on the side of the house. Three acres of meadows provide many play areas for large and small. The terrace from where one takes his meals with beautiful countryside views. Ideal for a family group or friends: the house is large and the layout of the rooms and bathrooms used to live with some independence. The kitchen-dining room overlooks the terrace. Lounge on the ground floor and TV lounge upstairs. All elements of comfort, all equipment. Sober and elegant restoration quality. The owners do not live on site. Fireplaces. Pleasant in all seasons. 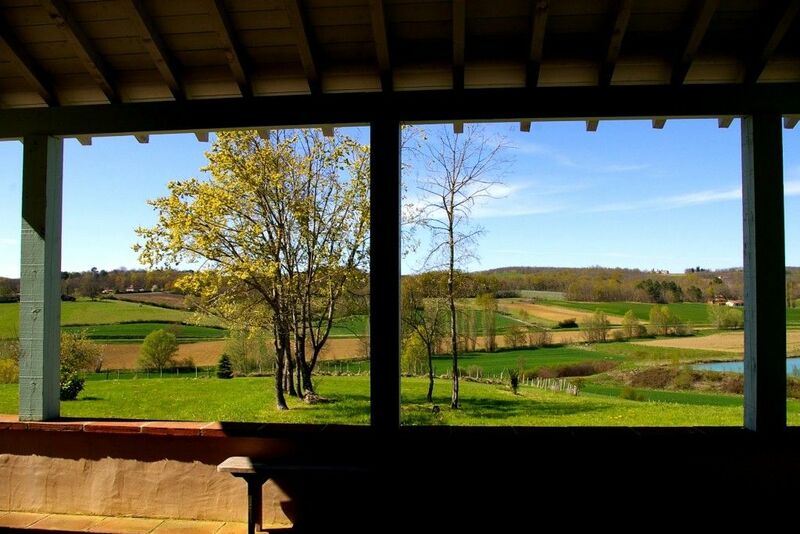 Open spaces, beautiful views of the countryside. very pleasant to live in the shadow of the terrace. Very comfortable, the bathroom next to the large cleaning room on the ground floor has a large tub and double sinks set into a wooden furniture and brick. Upstairs second bathroom with tub and double sinks. Also a separate shower room. Each separate toilet upstairs. Fenced pool. Terrace where you can take meals in the shade. Sunbeds. Barbecue. Board games. Bocce. Ping-pong. Small pond at the end of 8ha property where you can fish. (Too far for it to be a danger to children). Located in the 'hills' Bas-Quercy, Sibadal is at the junction between the limestone Quercy and the rich valley of the Garonne: the landscape is hilly and generous nature. The beautiful views and countryside. Easily accessible (1 hour from Toulouse airport, 20 minutes from Montauban, 2 hours from Bordeaux) but very quiet, Sibadal is in this southwestern region where the climate is sunny and mild. Lafrançaise commune located three kilometers offers all the facilities. Motorways of Paris, Toulouse and Bordeaux are within a half hour. Beautiful southeastern region of the Dordogne, Lot.